It’s gotta be the most confusing wood out there. Mahogany comes in many guises, including genuine, sapele, utile, Philippine, Spanish cedar, African and Fiji. In fact, some woods sold as mahogany aren’t even family members. For woodshop buyers, here are some notes that might help clarify the choices. Genuine mahogany (Swietenia macrophylla): The most popular species actually has many other names, too. These include Honduras, Peruvian, Bolivian, American, South American and bigleaf. The “genuine” title comes from the fact that early cabinetmakers and shipwrights used this species exclusively until it began to get a little scarce, after which those industries both turned to African and Asian substitutes. Genuine mahogany is among the most workable woods available, in part because of its legendary stability. It has relatively even coloring and grain characteristics within the same board, but the color from tree to tree can vary quite a bit. Boards in a bunk can range from gray to red, so check with the warehouse on color or sift through the rack if possible when buying. 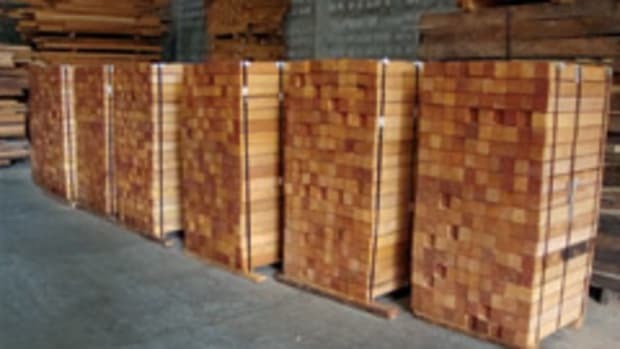 Hardness can also be an issue: this species roams in specific gravity from about 0.39 to 0.56, so it can be as soft as poplar or harder than hard maple. Specific gravity is simply the difference between the weight of a cubic foot of a wood species and the weight of a cubic foot of water (62.38 lbs.) 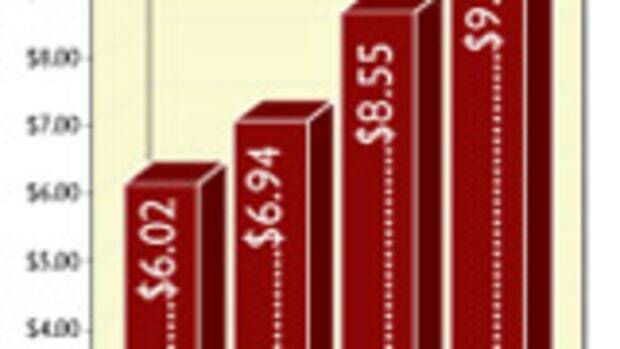 To calculate specific gravity, divide the weight of the wood by 62.38. Genuine mahogany, according to most sources, ranges between 24 and 35 lbs. That huge variation in both color and hardness lets some suppliers substitute other less valuable species for genuine mahogany. Most notable among these is the relatively bland lauan, which is sold in the U.S. as Philippine mahogany. It is generally a little bit redder than the real thing and, while it is in itself a valuable material, lauan is simply not as attractive. Genuine mahogany has a long history in both furniture and boatbuilding. It comes from a huge area of Central and South America, ranging from southern Mexico all the way through Brazil. The trees can be immense — up to 150 feet tall and more, with trunk diameters in mature trees at about 6 feet. Because of its stable nature, it can often be found in widths of 12” to 18”, and sometimes even wider. For example, wholesaler J. Gibson McIlvain usually stocks boards up to 35” wide. Restrictions by the Brazilian and Bolivian governments on harvesting and exporting during the last few years have turned buyers’ attention to Peru, where a large amount of the native growth has been felled. However, this species is still in good supply at fairly reasonable prices. It is becoming less available, in large part because it doesn’t do well as a farmed species. Genuine mahogany grows naturally as individual trees (usually fewer than five trees to the acre). When concentrated on farms where volume is essential to profit (that is, where trees are planted close together), it becomes very susceptible to insect damage. Speaking of harvesting, one close cousin of genuine mahogany, commonly known as Cuban mahogany, was harvested so heavily during the last 400 years that it is no longer a viable commercial timber and only rarely appears on the market. Genuine mahogany carves, cuts and turns beautifully and it is a pleasure to finish, although in some applications it does need a little grain filling. It behaves well with stains and dyes, and the rich color gives furniture and cabinetry a luxurious tone. African mahogany (Khaya ivorensis): This less expensive, but still beautiful, hardwood is found in a natural range that includes the Ivory Coast, Ghana, Nigeria and Cameroon in West Africa. If one thinks of Africa as being shaped like the handle of a pistol, these countries are all around the area where the trigger would be. The climate here is tropical and Cameroon is home to some of the wettest places on the planet with annual rainfall in the neighborhood of 400”. For perspective, the wettest spot in the continental U.S. is Aberdeen Reservoir in Washington, with about 130” annually. All that heat and moisture delivers wood that has very consistent color and grain, with a light pink to deep red range of pigment. The word most commonly used to describe this species is “lustrous,” which dictionaries define as having a sheen, gleam or radiance. These adjectives are usually associated with light and African mahogany does seem to glow when finished, especially as light rakes across a wide surface. The interlocking grain is usually straight, but crotches and other figured areas can be downright dramatic. When working this species, it feels a little heavier and harder than genuine mahogany and its variegated grain can appear as ribbons of light and dark color. There is little aroma and few woodworkers have noted allergies to it, but it does have a reputation for reacting with ferrous (iron-based) metals, so consider your hardware choices carefully. It can leave blackish stains if a reaction takes place. 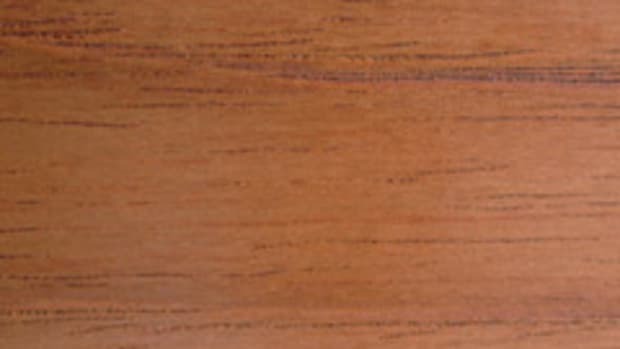 African mahogany is used in fine furniture and casework, architectural millwork, by luthiers for musical instruments, and also in window and door applications because, like genuine mahogany, it is quite resistant to water damage. In addition to ivorensis, the Khaya genus also includes several other commercially harvested species. 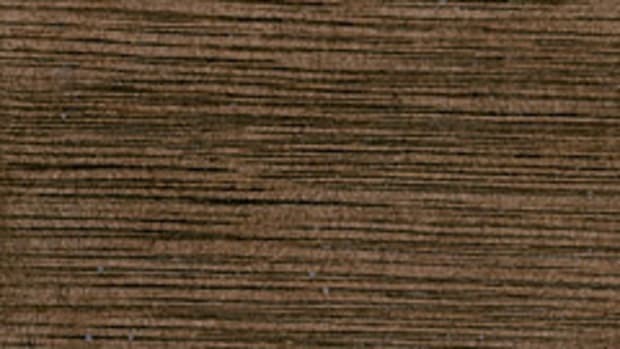 Your wholesaler might offer anthotheca, grandifolia or senegalensis options, all of which are correctly described as African mahogany. 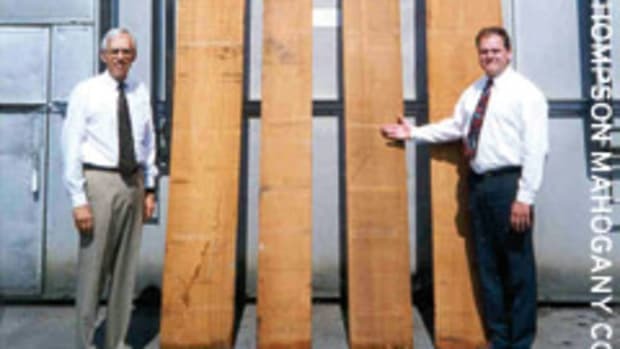 Sapele (Entandrophragma cylindricum): The third most popular option, sapele is a slightly smaller tree with mature diameters at about 4 to 5 feet. It grows right along the equator, from the Congo to Uganda, and also in Ghana and a few other spots in West Africa. Sapele is quite common as a veneer option for architectural millwork because of its dramatic light and dark ribbons when quartersawn. Machine dust from this species can be irritating, causing both skin and breathing problems, so a good dust collection system is a must. Despite that, it’s very popular because it costs only about half the price of genuine mahogany. It’s a relatively soft hardwood, a bit harder than other mahoganies, and it machines well. Sapele is generally a little darker than other mahogany species, running more to brown than red. 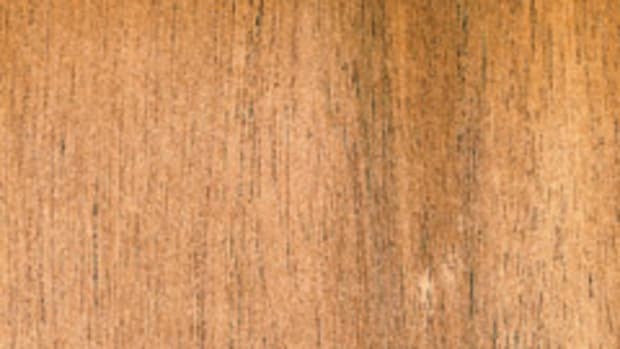 Flat-sawn boards are relatively uniform in color and grain, while quartersawn sapele is very distinctly striped. It can distort and move a little more than its cousins, too. The surface at times can be “hairy” because of the interlocked grain, and sanding can often produce better surfacing results than knives. A variant is pomelle sapele, which has a quilted surface that can reflect light in myriad directions, causing it to have exceptional depth and drama. Spanish cedar (Cedrela odorata): This species is a member of the mahogany family and is most definitely neither a softwood nor a cedar. It grows throughout most of South America and especially in a swath from Bolivia to Columbia and west to Peru. In color and grain, Spanish cedar looks a lot like genuine mahogany, although they smell very different. The former has an aroma that is decidedly similar to fresh-cut cedar, especially when milled. It is used in casework and millwork and often finds a home as a liner for closets and chests because it repels insects. As it is both lightweight and stable, Spanish cedar is a good choice for canoes, small boat hulls, musical instruments and even carving stock. It works well outdoors and is quite reasonably priced. And even though it doesn’t weigh much, it’s fairly strong structurally so it can be used in furniture, especially pieces that reside on decks and patios. Fiji mahogany looks like a legitimate and sustainable alternative to more expensive native timber from both Africa and South America. There might still be some political issues attached to it that a woodshop might want to research, but for now some eminent U.S. corporations such as Gibson Guitar are already betting on this new brand. Sipo (Entandrophragma utile): Often called simply utile, this species has been used in Europe for a long time as a mahogany substitute and is gaining popularity in the U.S. 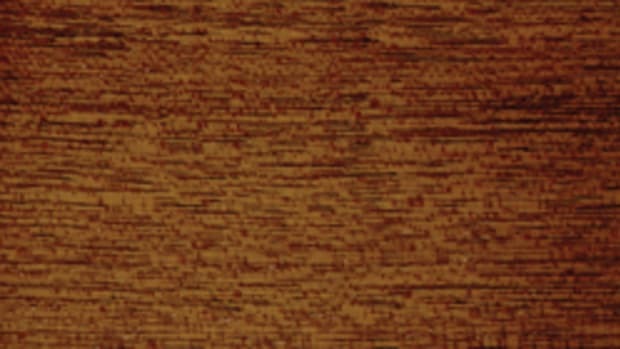 It is a relative of African mahogany that looks like a plain and somewhat darker version of sapele. It can be hard to dry in a kiln, but woodworkers like it because it behaves well around blades and that makes it a good choice for doors, windows and moldings. Utile has little bright flecks in it that reflect light. Unique mahogany alternative hits U.S.